(Nanowerk News) By using electric voltage instead of a flowing electric current, researchers from UCLA's Henry Samueli School of Engineering and Applied Science have made major improvements to an ultra-fast, high-capacity class of computer memory known as magnetoresistive random access memory, or MRAM. 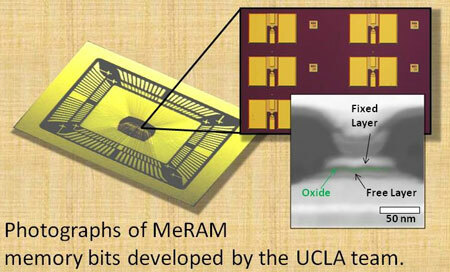 The UCLA team's improved memory, which they call MeRAM for magnetoelectric random access memory, has great potential to be used in future memory chips for almost all electronic applications, including smart-phones, tablets, computers and microprocessors, as well as for data storage, like the solid-state disks used in computers and large data centers. MeRAM's key advantage over existing technologies is that it combines extraordinary low energy with very high density, high-speed reading and writing times, and non-volatility — the ability to retain data when no power is applied, similar to hard disk drives and flash memory sticks, but MeRAM is much faster. Currently, magnetic memory is based on a technology called spin-transfer torque (STT), which uses the magnetic property of electrons — referred to as spin — in addition to their charge. STT utilizes an electric current to move electrons to write data into the memory. Yet while STT is superior in many respects to competing memory technologies, its electric current–based write mechanism still requires a certain amount of power, which means that it generates heat when data is written into it. In addition, its memory capacity is limited by how close to each other bits of data can be physically placed, a process which itself is limited by the currents required to write information. The low bit capacity, in turn, translates into a relatively large cost per bit, limiting STT's range of applications. With MeRAM, the UCLA team has replaced STT's electric current with voltage to write data into the memory. This eliminates the need to move large numbers of electrons through wires and instead uses voltage — the difference in electrical potential — to switch the magnetic bits and write information into the memory. This has resulted in computer memory that generates much less heat, making it 10 to 1,000 times more energy-efficient. And the memory can be more than five-times as dense, with more bits of information stored in the same physical area, which also brings down the cost per bit. The research team was led by principal investigator Kang L. Wang, UCLA's Raytheon Professor of Electrical Engineering, and included lead author Juan G. Alzate, an electrical engineering graduate student, and Pedram Khalili, a research associate in electrical engineering and project manager for the UCLA–DARPA research programs in non-volatile logic. "The ability to switch nanoscale magnets using voltages is an exciting and fast-growing area of research in magnetism," Khalili said. "This work presents new insights into questions such as how to control the switching direction using voltage pulses, how to ensure that devices will work without needing external magnetic fields, and how to integrate them into high-density memory arrays. "Once developed into a product," he added, "MeRAM's advantage over competing technologies will not be limited to its lower power dissipation, but equally importantly, it may allow for extremely dense MRAM. This can open up new application areas where low cost and high capacity are the main constraints." Said Alzate: "The recent announcement of the first commercial chips for STT-RAM also opens the door for MeRAM, since our devices share a very similar set of materials and fabrication processes, maintaining compatibility with the current logic circuit technology of STT-RAM while alleviating the constrains on power and density." The research was presented Dec. 12 in a paper called "Voltage-Induced Switching of Nanoscale Magnetic Tunnel Junctions" at the 2012 IEEE International Electron Devices Meeting in San Francisco, the semiconductor industry's "pre-eminent forum for reporting technological breakthroughs in the areas of semiconductor and electronic device technology." MeRAM uses nanoscale structures called voltage-controlled magnet-insulator junctions, which have several layers stacked on top of each other, including two composed of magnetic materials. However, while one layer's magnetic direction is fixed, the other can be manipulated via an electric field. The devices are specially designed to be sensitive to electric fields. When the electric field is applied, it results in voltage — a difference in electric potential between the two magnetic layers. This voltage accumulates or depletes the electrons at the surface of these layers, writing bits of information into the memory. "Ultra-low–power spintronic devices such as this one have potential implications beyond the memory industry," Wang said. They can enable new instant-on electronic systems, where memory is integrated with logic and computing, thereby completely eliminating standby power and greatly enhancing their functionality."